I have the opportunity to talk with a lot of people in a lot of different industries. 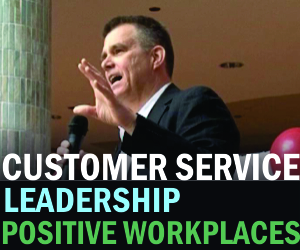 Although my primary focus is consulting and training on customer service, customer experience, leadership and workplace wellness, I get to learn a lot about the things that are keeping people up at night. Over the last year, I’ve noticed a significant uptick of frustration in three areas. The good news is that I’ve also learned some very effective ways of dealing with them. I’ve outlined them below, and am more than happy to go into greater detail for anyone who is interested! Senior leaders are starting to get hugely frustrated that so much of their vision and messaging just isn’t making it deeply enough in their company. A lot of the passion and great strategic direction — around customer experience in particular — simply isn’t getting through organizations to the front lines. Ironically, at the same time that CEO’s are expressing frustration at the slow improvement in customer-centricity, their front line employees are telling us how demotivating it is to work for a company that isn’t committed to customer experience. Huh. What do Barak Obama, Donald Trump and Elon Musk have in Common? (I know – it sounds like the first line in a really bad joke…). The answer is that they’ve all used the popular micro-blogging platform, Twitter, to get their message directly to the public. They weren’t at the mercy someone else’s timeline, or of diluted, inaccurate or biased reporting. And all three have used this direct message approach with great success. If you want your employees to know what you’re thinking, planning and dreaming, it’s a great model to follow. You have to be careful, of course. Unlike these three, you may not want a giant public forum like Twitter, but there are some really interesting options that can have the same outcome. (Big Hint: NOT email). You can create fireside-chat-style videos. We’ve helped clients create internal webinars and podcasts. There are a lot of cool things you can try. If you want to take an indirect approach that doubles as great marketing, you can even take a cue from Sir Richard Branson, who frequently has interesting posts on LinkedIn that explain his vision and passion. The less accessible you are, the more detached your team will feel. Set up a town hall once every couple of months where employees can interact and ask questions of you directly. Company too big? No problem. Use a webinar format to accomplish the same thing. Rather than just pass down an edict to all managers that customer experience is important and hope that the message cascades down, get them involved. Find ways to help them take ownership and create excitement. There are a lot of awesome ways to do this. Silos within organizations have always been a challenge, but the frustration with them is growing — particularly when it comes to customer experience. We’ve had dozens of senior leaders telling us that a lot of opportunities are being missed because poor interdepartmental communication and collaboration. The reality is, in large organizations, it’s unrealistic to expect people to have the same knowledge and interest in other departments as they would have in their own. There is too much to know. Too many constantly moving parts. A little bit of chaos is inevitable. What you can do, however, is create conditions that make interdepartmental cooperation a whole lot easier. One of the most effective methods for doing this is by leveraging the principals of networking. The more diverse and robust a person’s personal network is within a company, the more adaptable and agile they — and their department – will become. When you can facilitate the growth of these networks, it creates a myriad of side-benefits. It takes time and subtle planning though — you have to avoid blatant contrivances. Do we invest in developing our people, only to have them leave a year or two later? If we don’t make the investment, it is unlikely that we can significantly improve customer service levels. If we do invest in them, there is a risk they will leave and we now have to train new people. What is the answer? But there is, of course, much more to it than that. The bigger question we need to ask ourselves is: Why are so many employees disengaged? The research tells us that it’s not money. In fact, when you read between the lines, employees are disengaged because – get this – because we aren’t actually engaging them. We aren’t giving them something meaningful to work for. We aren’t helping them get better or learn new stuff. We treat employees as commodities, not as people. The best way to reduce employee turnover is to engage them. That’s a given. And the best and fastest way I know of to engage employees is through learning. Bring in training programs. Teach your managers how to actively coach and mentor their teams. Introduce lunch and learn programs. If you’re not sure about this, you’re not alone. ‘Learning opportunities’ is not something that typically comes up in conversations about retention strategies. But here’s something to consider: We are all immersed in a learning culture. Most people today are, quite literally, addicted to learning. Need proof? How many times over the last week have you been on Google, YouTube, Bing or any of the other search engines? How about in the last 24 hours? Google, YouTube and their predecessors have been part of our lives for over twenty years now. We are constantly looking stuff up and researching — for pleasure. We like to learn new stuff. Sure, a lot of it might be considered trivial — like looking up Beyonce’s latest video or trying to find out why we have Daylight Savings Time — but there is no denying that learning is now an integral part of our social fabric. So here we are with an addiction to learning, but spending over half of our waking moments at work – an environment that doesn’t provide this same stimulus. Is it any wonder that we become a little antsy? It’s not a coincidence that study after study tells us that training, and active coaching and mentoring by managers, dramatically increases engagement and retention. The great part about this solution is that the benefits extend far beyond employee retention. H.R. Magazine reports that, when companies spend a minimum of $1,500 per employee, per year on training, they average 24% higher profit margins.